This home is, perhaps, the best example of the Romanesque Revival style as applied to the design of a home in Detroit. 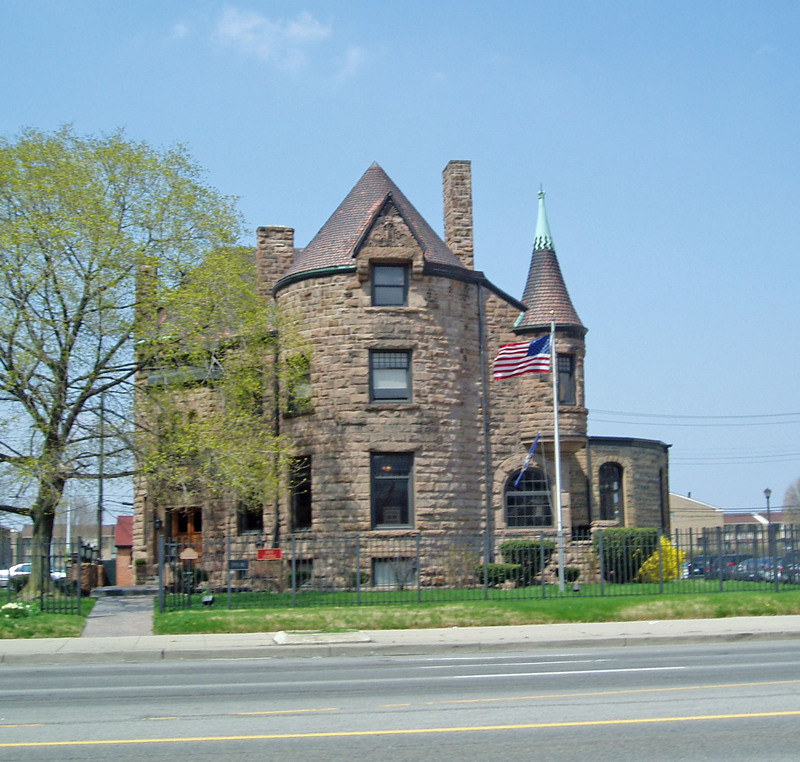 It is a two and one-half story residence with a massive stone turret in one corner facing East Jefferson. That prominent turret is topped with an attractive conical roof. You see a variety of other large bays protruding from the home. The entire residence is clad in coursed rock-faced stone and that gives it a very distinctive appearance on East Jefferson. As is typical for the Romanesque Revival style, there are several rounded windows and an emphasis upon the large stones. At the rear is a one-and one-half story carriage house done in red brick and completed about two years after this home was completed. This is, so far as I know, the only edifice in Detroit designed by the accomplished and creative eastern architect, William Henry Miller. Miller, born in 1848 in the small hamlet of Trenton, New York, was the first graduate of the architecture program at Cornell University. He later returned to teach at that institution and designed many building now found in Ithaca. He designed a library, the president’s home, several dormitories and fraternity homes for Cornell University. He also used the Romanesque Revival approach to design buildings for Wells Seminary in Aurora, New York—the second college for women founded in the United States and funded by Henry Wells who established both the Wells-Fargo and American Express firms. That institution is now co-educational Wells College. So far as I know, Henry Wells was not a relative of William H. Wells whose home in Detroit is pictured on this page. Several people have created to present information about “castles” found in the United States. One of these websites, cited below, identifies 19 “castles” that grace the landscape in Michigan. The William H. Wells residence is listed as one of those 19 castles.